Spring is in the air, and that usually means a fresh start. Many of us take the time to clear the clutter in our homes, and even clear the clutter in our lives. Spring is the time to clear out the dinginess that has crept in during the winter. And, while you are cleaning out the house, and possibly even getting rid of mental clutter and other clutter in your life, don’t forget to clean out the financial clutter as well. When you get new insurance policy papers, you can usually shred the old policy papers. Once you have reconciled your account statements with your records, you can usually get rid of receipts (unless you need them for warranties or taxes). Bills can usually be shredded after they are paid, and show up on your bank statement. There are a number of documents that you don’t need to keep indefinitely. Shred them, and move on. Now that you’ve cleaned out your files, it’s time to make sure you are properly organized. Set up a filing system that works for you. You want to be able to keep track of your most important financial documents, as well as other items of interest. I have a folder on my desk where I put tax receipts as soon as I receive them. There are also a number of tools, like Shoeboxed, which can help you organize your finances. Whether you use a file cabinet, or whether it’s all digital, put together a system to keep things organized. If you have the option to go paperless, take it! Arrange to receive your statements and financial documents electronically. You can file them in a password-protected file on your computer, and reduce the clutter that ends up around your home. Going paperless can be good for the environment, as well as make things easier for you. Prescreened offers can start to clutter up your home, and even lead to poor financial decisions. You can de-clutter your financial life with the help of opt-out resources that can reduce your junk mail and unsolicited calls. Canada has a National Do Not Call List, and it is worth noting that you have to opt-in for commercial email, thanks to Bill C-28. There are also lists, like iOptOut, that provide a way for you to get taking off marketing lists. Figure out what you want to accomplish in the coming year, in terms of finances. Create a financial plan that makes sense for you. Even if you don’t account for every penny, look at the broad strokes of what you need to do in order to accomplish your goals. If you have debt, now is a great time to create a pay down plan. Put together a plan to pay off your debt. List all of your debts, along with your payments and interest rates. Figure out a way to save more money each month in order to get to the point where you can pay down your debt. Can you make more retirement plan contributions? If you could be putting more into your RRSP, look for a way to do so. Increase your contributions. You’ll be better prepared for the future, and you’ll have a more fine-tuned plan for your money this year. Finally, look through your investment portfolio. Consider your asset allocation. Do you need to buy more stocks, or should you increase your bonds? Do you have losing stocks that aren’t likely to recover? While you don’t want to fiddle too much with your investment portfolio, it is a good idea to review it periodically and make changes as necessary. This sounds like a good plan to periodically clean your finances. Left unchecked it is easy for this kind of stuff to waste time or money. So by taking time to address it now, it’ll save you in the long run. In addition to this I would also add in comparing the rates on things like your bank account, credit card and insurance. Now might be the time to shop around to get a better deal. I love the one about going paperless. One thing you said is of vital importance: encrypt and password protect your documents! If you have a Mac, you can encrypt your documents automatically using FileVault 2 that comes with OS X Lion. Something to look into. 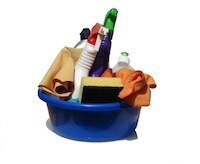 Thanks so much for the reminder to spring clean our finances! Good tips! Out of the eight things you suggested, we have been observing six of them. And I am proud to tell the world that when we started creating our financial plans, we were able to pay off our credit card debts and bank loan. We are now living almost debt-free. I say almost because we still have some loans from our friends that we need to settle, though they are very minimal amount as compared to our credit card debt and bank loans.